Elastic Path is pleased to introduce PIM by Agility, a new Extended Commerce solution aimed at making advanced product information management simple and elegant for even the most complex product data. Agility Multichannel, provider of Agility® “Product Management for Commerce” software, has partnered with Elastic Path to provide a fully integrated solution for the on-boarding, enrichment approval and syndication of product marketing information for all channels and touch points. Agility has been recognized in the 2014 Forrester Wave™ and the Gartner MQ. With its award-winning Agility Modular Interface (AMI), which can be custom-configured for every stakeholder, it pushes the boundaries of Product Information Management (PIM) and Master Data Management (MDM of Product Data). Agility’s workflows, syndication engine, proprietary Adobe CC plug-in and seamless integration with Elastic Path streamline and safeguard production and delivery of all creative and digital commerce promotions while optimizing the customer experience. Agility is the most extensible, easy-to-use and team-spirited Product Management for Commerce solution in the industry. PIM by Agility delivers the most advanced features of PIM combined with groundbreaking syndication and production tools to optimize the product information workflow for large, mid-sized, and high-growth organizations. Elastic Path Commerce offers a flexible, high-performance catalog that’s perfect for many businesses. For customers with complex product information requirements involving large numbers of suppliers, affiliates, channel partners, and merchandise departments, our PIM by Agility extended solution adds sophisticated, dynamic workflow functionality that enhances security, governance and compliance, adds powerful data integration tools, and wraps it all up in an award-winning modular management interface. Agility Modular Interface (AMI) gives all business stakeholders – including Merchants, Product Managers, Content Managers, Translators, Agencies, Ecommerce and Creative – the most intuitive, user-friendly experience and workflows. AMI’s extensive library of gadgets lets business users configure web-based workspaces with ideal functionality, which can be simply merged with other systems and provide live lookups to other data sources. Workflows that are easy to set up, use and change. All governance functions can be accessed by business “super-users”. Security: Content History and audit trail for all attributes so you know who did what and when. Easy-to-use WYSIWYG-based Data Integration (DI) toolkit for mass uploads, data profiling, cleansing, data quality and data validation. Easy to use Business Intelligence (BI) toolkit for reporting and visual analytics. Permission-based easy assess for all to assets and documents through integrated DAM or existing customer DAM. Built-in, in-depth support for Adobe for creative digital pages, print, and mobile Apps. Agility Syndication and Agility DI allow for incremental and batch feeds to internal systems, other channels, marketplaces and data exchanges to B2B and B2C customers. High degree of scalability – customers range from 10 to 1,000-plus users, single country to global – all from one central server. No limit to SKUs and attributes – Agility is designed to support millions of SKUs and 100’s of millions of attributes instances. Global languages and localization capabilities – customers today use Agility in more than 50 languages and country markets. Fully extensible, published APIs and ability to create your own gadgets. On-site or hosted deployment options. Integration with Elastic Path and syndication via batch and incremental updates triggered through easy-to-set-up Agility workflows. Ease of adoption & short time to go live, proven to provide a quick ROI. Watch an instant video demo of PIM by Agility in action. Want to hear more? Contact us to see how powerful and easy a PIM can be. New York City (October 13, 2014) – Elastic Path Software Inc., an ecommerce company helping the world’s biggest brands generate more revenue, and Agility Multichannel, a leading Product Information Management (PIM) vendor, today announced a key partnership agreement to help enterprise eBusiness teams create a best-of-breed commerce solution. Award-winning PIM software Based in York, UK, and Chicago, US, Agility Multichannel’s award-winning Agility® software features a fully configurable interface for businesswide-acceptance and ease-of-use, as well as seamless integration with all channels and touch points, letting companies deliver their product data everywhere it needs to go, instantly, with inviolable integrity and quality. September 2014 – Technology Leadership Award for Marketing Excellence from Ventana Research to Office Depot/Max, specifically for their work using Agility. May 2014 – Agility is highly ranked in first-ever ‘Wave’ report on the PIM marketplace by Forrester Research. November 2012, November 2013: Agility ranked in Gartner’s Magic Quadrant in the MDM of Product Data category. "Increasingly, marketing is going digital to be where customers are. To communicate accurate and consistent product information across an omnichannel landscape, they need a PIM solution to overcome the scale and complexity digital channels create," wrote Forrester in its Forrester Wave, Product Information Management (PIM), Q2 2014. Forrester said Agility is "well suited for firms that need to syndicate product content to multiple channels and includes integration with Adobe’s Creative Cloud (CC)". 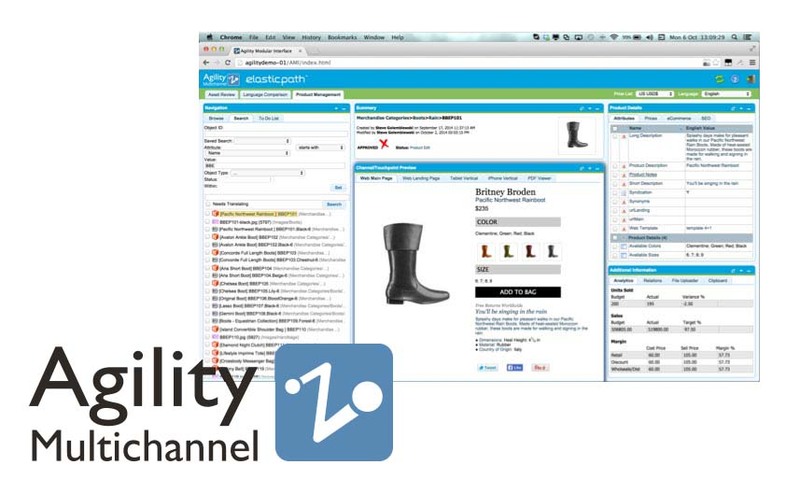 Agility Multichannel’s software product Agility® is a simple-to-use but highly sophisticated Product Information Management (PIM) and Master Data Management (MDM of Product) solution that puts your most valuable data at the stable core of a robust multichannel commerce strategy. Customers include Allied Electronics, Avon Products, Dunelm Group and Office Depot. Headquartered in Chicago, US, and York, UK, with integration and reseller partners throughout the world. For more information visit www.agilitymultichannel.com. This short video shows how multiple contributors can work seamlessly between three core solutions – Agility® Product Information Management (PIM), Adobe® Experience Manager and Elastic Path® Commerce – to integrate, build out and syndicate product information to multiple channels and touch points, bringing products to life for customers. A Best-of-Breed Commerce Suite from Agility Multichannel on Vimeo. Can’t see video? View the replay on Vimeo.